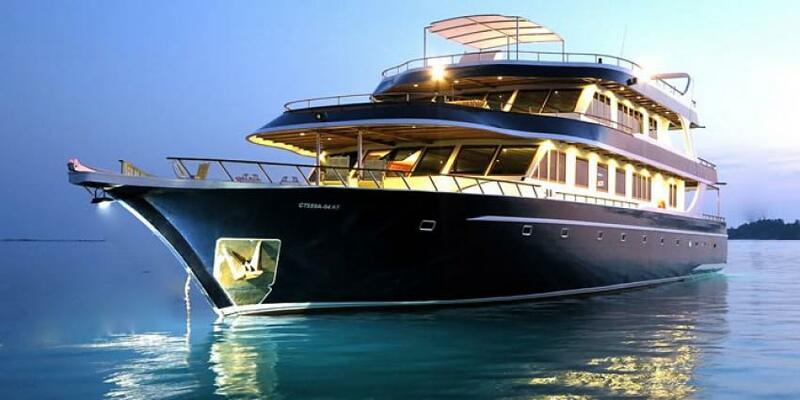 Ocean Divine is a luxury Liveaboard, that offers trips to stunning atolls of Maldives. Ocean Divine offers accommodation for 14 persons. There are 5 Deluxe cabins and 2 Master cabins on board. All are placed on a lower deck,have private facilities and equipped with individual air conditioning. For more comfort each stateroom supplied with wardrobes and fresh towels. Lounge area of Ocean Divine is comfortable and spacious, perfect for relaxing after diving day. Here you will find cozy couches, where you can sit and enjoy ocean view in big portholes. Also, there are a lot of outdoor spaces on the board. Nice sunloungers will help you to relax and enjoy the warm rays of Maldivian sun. To ensure your safety on board Ocean Divine has life vests, first aid kits, fire alarm fire extinguishers. Ocean Divine is a photographer friendly boat. Maldives is a famous destination for photo enthusiasts. The boat has a computer, that can be used for downloading photos that been made through the day, also charging points for photo equipment. Ocean Divine offers diving on unspoiled dive spots of North Atolls of Maldives, like Lhaviyani and Noonu. Here divers will get a chance to visit manta cleaning station and shark cleaning station, discover walls, reefs, caves and pinnacles. Ocean Divine itineraries include diving at The North and South Maldivian Atolls, visiting of Central Atolls, so you can see all treasures of this unforgettable country. Central Atolls represented by Laamu and Male. This destination is best for channel dives and also it’s a good opportunity to meet hammerheads. Southern Atolls is all about sharks. Whale sharks are often can be met here. Although diving on Maldives is available all year round, time from November to May considered as the best for diving here.